2. Máy Dùng Muối "Water Softener"
Những Tiện Lợi Của Một Máy "Water Softerner"
Bấm vào đây để lấy tờ "brochure"
Thêm thùng than bên trên để hút chất Chlorine & Chloramine trong nước. Chiếm ít diện tích nơi đặt máy. "Water Softener" làm việc như thế nào? Hard water flows over resin in the resin tank. Resin is in the form of tiny beads that have a special chemical property. At low concentration of sodium in typical hard water, the resin beads adsorb (combine with them) the hardness of water and replace it with an equivalent amount of sodium in water. As hardness is removed the water becomes "soft". The resin has a fixed capacity of the amount of hardness it can remove. Once that happens the resin can no longer remove the water hardness and the resin is called "saturated" or exhausted. Fortunately, the same resin when exposed to high sodium chloride (common salt) concentration reverses the process and adsorbs the sodium and releases the hardness. This property is utilized in regenerating the exhausted resin. This is done by temporarily stopping the softening process and exposing the resin to high salt solution from the brine tank. The entire process is controlled by the controller valve which works either on time of regeneration (normally set at 2:00 AM) or by a meter valve inside the controller preset to a calculated amount of water that can be softened before regeneration. After regeneration the controller rinses the resin to remove all salt not adsorbed by the resin. The entire cycle lasts less than 1 hour. Ví dụ: Nước có độ "hardness" là 15 grain per gallon, lượng muối do "water softener" thêm vào trong 2 lít nước sẽ là: 2L x 15gpg x 8mg/L/gpg = 240mg [khoảng chừng như lượng muối có trong 16oz (0.47L) sữa "whole milk"). Water Softeners with a Timered Valve: Single Water Softeners with a timered valve are programmed to regenerate at a specific time of day. They are usually scheduled to regenerate at 2am, when the demands for soft water are expected to be very low. These can be set to regenerate every day, every two to three days, or on certain days of the week. Water Softeners with a Metered Valve: Metered Water Softeners are prompted to regenerate based on the amount of water that has passed through the unit. Like the timered softeners, these can be programmed to regenerate at a certain time of day. Instead of regenerating on a specific day as a timered softener does, the metered softener does not schedule a regeneration until the specified amount of water have passed through the softener. These units can save water by preventing unnecessary regenerations since it does not regenerate until the resin is near its capacity. Twin Water Softeners with Metered Valves: Ideal for situations where uninterrupted flow of soft water is a must, our twin softeners consist of two resin tanks. One resin tank is always in service, while the other tank is in standby. When the meter determines that the resin is near its capacity, it will switch the tank in standby to be in service, and the tank containing the exhausted resin switches into regeneration, and then into standby. Enviro-Twin Water Softeners: <Click here for all systems> The PureGen Enviro-Twin water treatment system. This system can be custom designed for most residential and light commercial applications. By using one control valve to backwash 2-3 tanks, you can cut the waste water and your cost significantly. Available as a complete system or you can buy adapters to build your own system. No more internal tank separators and traditional tanks. Simplified system installations lower your cost even further! Another Green technology from PureGen! 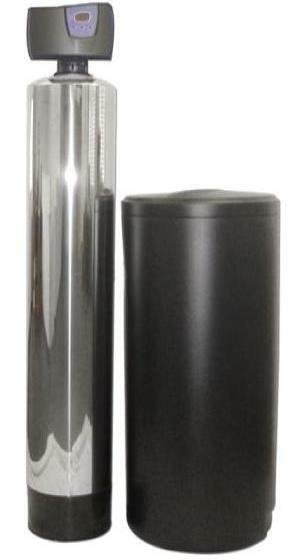 Eco-Twin Water Softeners: <Click here for all systems> The Eco-Twin is a simple stacked tank design. Acid washed cocnut shell GAC removes chlorine, odors, taste and dissolved organic chemicals protecting your family and your appliances while traditional softening resin create the ultimate yourwhole house water treament system. Simpler than single tank designs with internal seperators, and much higher capacities. We can customize system with specialized media, contact us for details. Available with Catalytic GAC. Available with the 2510, WS1, ProFlo and many other control valves. Take less space compared to Dual-Max. 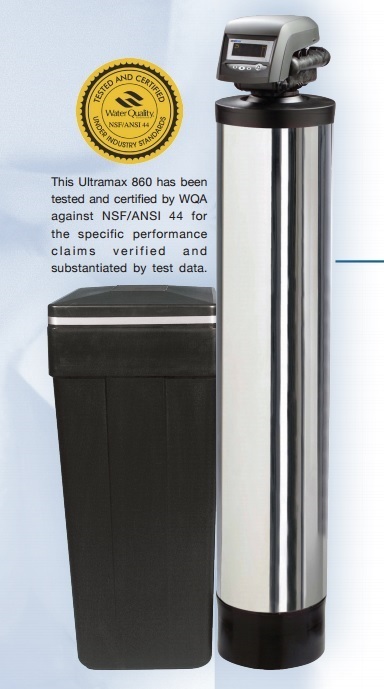 A Water Softener can save you thousands of dollars. Fortunately, the same resin when exposed to high sodium chloride (common salt) concentration reverses the process and adsorbs the sodium and releases the hardness. This property is utilized in regenerating the exhausted resin. This is done by temporarily stopping the softening process and exposing the resin to high salt solution from the brine tank. The entire process is controlled by the controller valve which works either on time of regeneration (normally set at 2 AM) or by a meter valve inside the controller preset to a calculated amount of water that can be softened before regeneration. After regeneration the controller rinses the resin to remove all salt not adsorbed by the resin. The entire cycle lasts less than 1 hour. The softening process adds a very small amount of sodium in the water which comes from the exchange process. It is not directly added from the brine tank. For example, water with 10 grain hardness will have a sodium addition of 80 ppm in the water after softening (8mg of sodium in 1L of water for each 1grain hardness). e.g., Amount of sodium in 2L of softened water in water with hardness 15gpg = 2L x 15gpg x 8mg/L/gpg = 240mg (about the same amount of sodium in 16oz of whole milk). Concern salt (sodium) amount added by the water softener? Click here. Enviro-Twin Water Softeners: The PureGen Enviro-Twin water treatment system. This system can be custom designed for most residential and light commercial applications. By using one control valve to backwash 2-3 tanks, you can cut the waste water and your cost significantly. Available as a complete system or you can buy adapters to build your own system. No more internal tank separators and traditional tanks. Simplified system installations lower your cost even further! Another Green technology from PureGen! Soft water versus hard water has many benefits. Like clean shiny silverware and glassware. No one likes the spotty chalky hard water spots on their silverware, glasses or dishes. Since shampoos, soaps and detergents do not lather well in hard water, naturally soft water or hard water made soft through a water softener restores the rich lathering cleaning ability and cuts down on the usage and costs of soaps and detergents by 75%. Also, one can return to natural chemical free healthy soaps and laundering agents. The harsh chemicals in nowaday soaps and detergents were invented to combat hard water and still have some lather. With soft water you will not need these chemical based cleaners. Hair and skin feels softer, cleaner and smoother. Detergents easily rinse out with soft water. Tests have been done taking laundry that had gone through a rinse cycle in hard water, taken these "rinsed" clothing out and putting them in clean soapless water, agitating them and watching soap still come out of the clothing. Soft water allows detergents to completely rinse out. Fabrics are also softer without hard minerals become trapped in them. Fabrics last longer and whites stay white without the dingy gray caused by hard water. Soft water also does not leave chalk or orange rings around bathtubs and sinks. This saves time in house cleaning and embarrassment of having cleaned yet finding it difficult to remove all the hard water deposits. Soft water also preserves the life of all water using appliances such as coffee and ice makers, dishwashers, and clothers washers. Hard water wears appliances out quickly and requires more energy use as appliances do not work as well when they are corroded or clogged with mineral deposits. Savings on energy costs and on properly working water heaters is another benefit too. Let's look at average replacement of some of the basic appliances due to hard water corrosions; $360 water heater, $90 faucet set, $80-$1,000 washer/dryer set, and the entire plumbing system $2000-$4000. The first water softeners were invented in 1912 before the advent of the modern washing machine as a basic household appliance that converts hard water into soft water which we all find desirable. 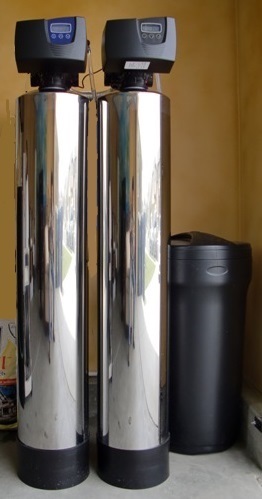 It has continued to be a basic household appliance and is so appreciated by its owners that it is rare to see a water softerner sold second hand, usually owners just take them with them when they move. The benefits of a water softener are more than one would realize initially and usually involve a cost savings that more than pays for the softener in about 4-5 years and most softeners are expected to last at least 10 years, with many lasting much longer. Your soap and shampoo will lather better. Your hair and skin will feel noticeably cleaner, softer, and not as dry. And there will be no soap scum or mineral deposits to clean off sinks, showers, tubs and toilets. Clothes will be softer, cleaner, whiter and brighter. Plus they will last longer. Using soft water and pure soap products increases the life of clothing, towels, and linens up to 33%. Without hard water service issues, washing machines last longer, too. Dishes will clean up more easily, and be spot free, without the gray film glasses get when etched by mineral-ladden water. Plus hands will feel softer and look better. Water-using machine appliances will last longer and run better. Why? Because hot water heaters, washing machines and dishwashers used with hard water can wear out 30% faster. Over time, soft water savings can really add up. For instance, conditioned water not only delivers greater washing power, it reduces the amount of soap you need to use by to 70%. In fact, the Bureau of Statistics found that between 17 and 20.8 cents of every dollar are spent on cleaning products. Soft water can reduce that bill by up to 65%. It can also eliminate extra rince cycle and hot water. Plus using less detergent, household cleaners and chemicals is better for the environment. The bottom line? Soft water can save you thousands of dollars. 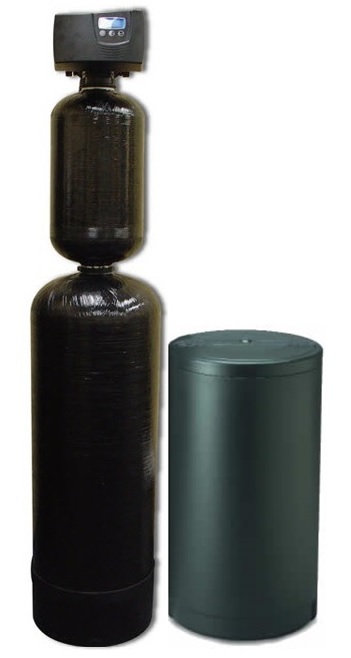 The most durable and best performing water softeners are those built with Fleck valves and Structural tanks.